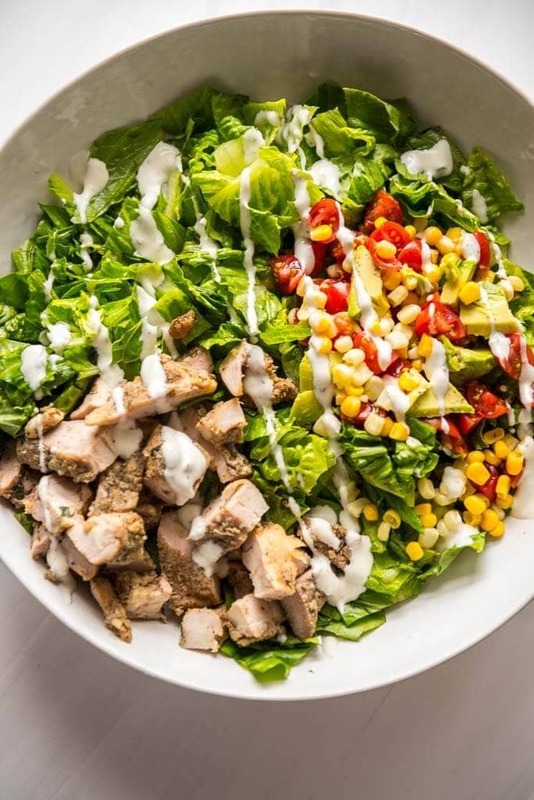 Use your leftover grilled chicken thighs and leftover corn salsa on top of fresh crisp romaine lettuce for the easiest entree dinner salad you can make! This Grilled Chicken Taco Salad will be a new favorite. One thing I don’t love is having to cook an entire new meal every night and other thing I don’t love is wasting leftovers. This Grilled Chicken Taco Salad is a solution to both of these problems! 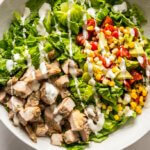 It uses leftover grilled chicken and leftover corn salsa along with crisp greens to create an quick and delicious meal perfect for those nights were you want a fresh and healthy meal but don’t have a lot of time or energy. Plus, you can use up the leftovers from earlier in the week and you’ll tackle cleaning out the fridge at the same time! Let’s just talk about these grilled chicken thighs for just a quick minute. I know I did a whole post about them, but seriously, make them if you are not convinced already. Look at all the amazing delicious things you can make with them! 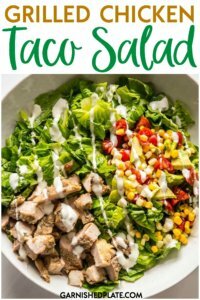 From grilled chicken street tacos to this delicious salad and way beyond, they are so worth a few minutes of your time to make up ahead and have on hand for easy meals. Next up I had some leftover corn salsa that I originally used to top off this tri-tip and I wanted to use up the extra because it was too good to go to waste. Even with the avocado this really does keep in the fridge for a day or two as long as it’s covered tightly because of all the lime juice. Okay, one last dressing note, if you want to make your own, I have a jalapeño ranch dressing that is soooo good, so if you have the time/motivation, give it a try! 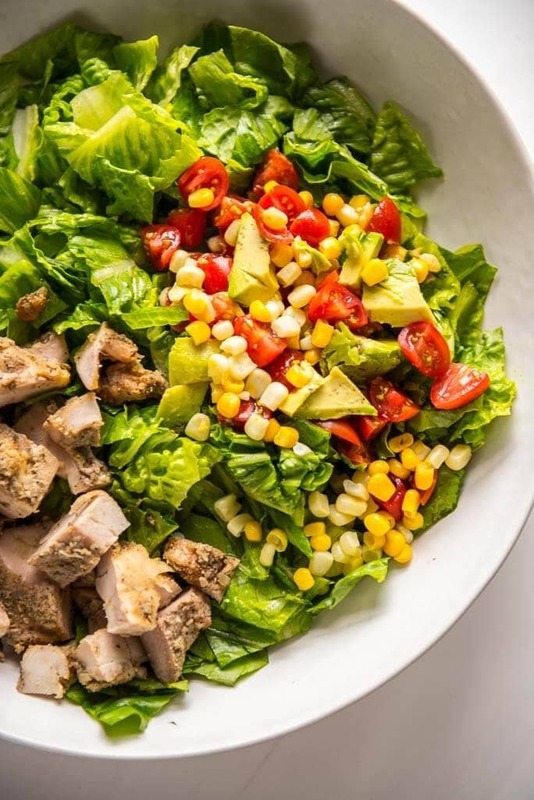 Use your leftover grilled chicken thighs and leftover corn salsa on top of fresh crisp romaine lettuce for the easiest entree dinner salad you can make! Add lettuce, chicken and salsa to a bowl. Toss with ranch dressing as desired. Oh my, I need to make this right away. It looks so delicious! 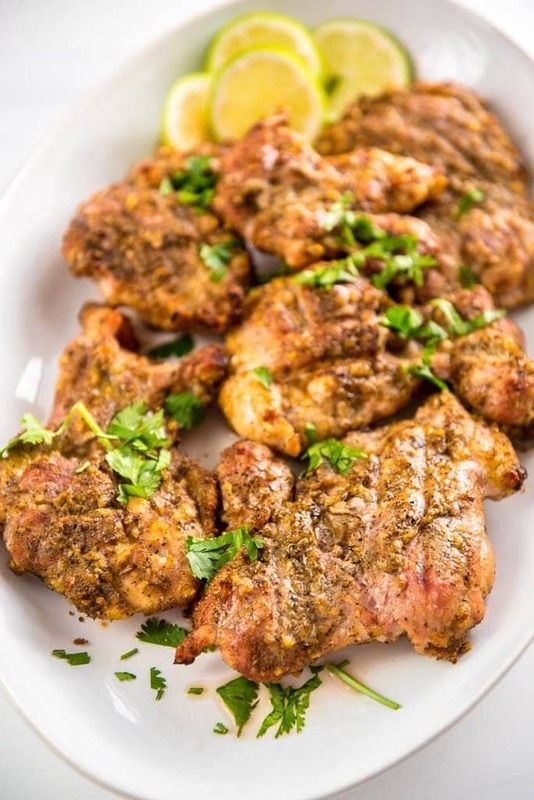 What a great way to use leftover grilled chicken! Your taco salad looks perfect and delicious! I love Mexican food and this looks like a great lunch option! This is a gorgeous salad -- and since my family is on a new "healthier eating" kick, we'll be making this for dinner this week! Taco salad is one of my favorite things! 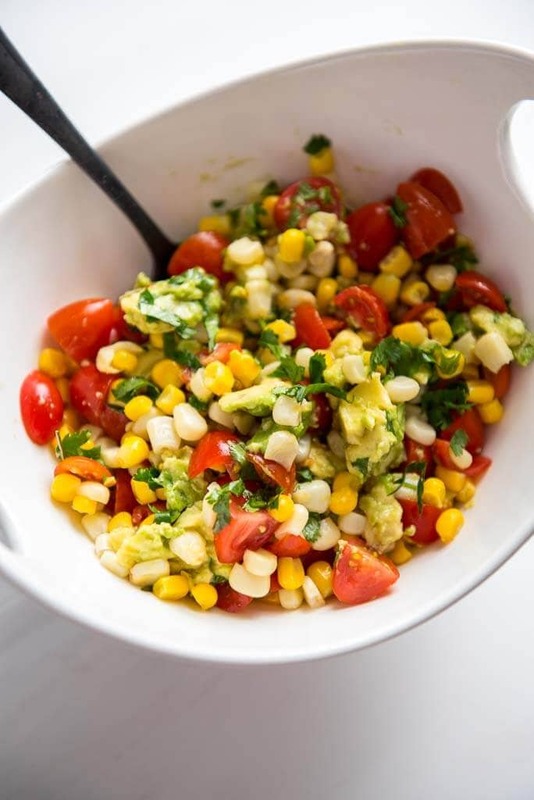 Loving the looks of that corn salsa! I love tips that help me save time and money in my kitchen without taste sacrifice. The next time I have chicken leftovers, I will combine it in your wonderful salad inspiration. But I'll probably use my own homemade dressing.